Captain Srinivasa Murthy Regional Ayurveda Drug Development Institute, CCRAS, Govt. of India, Chennai – 600 106, Tamil Nadu, INDIA. Background: Santalum album L. (Fam. Santalaceae) is a small evergreen tree distributed in South India mainly on the Deccan plateau, especially in Mysore and Tamil Nadu. The heartwood is highly prized and medicinally useful; Santalum album is one of the ingredients in many Ayurvedic and Siddha formulations. Objective: The present study brings out macro-microscopic atlas on heartwood of medicinal plant Santalum album L. Materials and Methods: Sections and powder were observed and photographed under different magnifications with the help of Olympus BX51 Microscopic unit fitted with Olympus Camera. Results: Macroscopically odour and taste, microscopically tyloses, fibres, tailed pitted vessels, uni and biseriate medullary rays, brownish content and oil globules are the unique diagnostic characters reported. 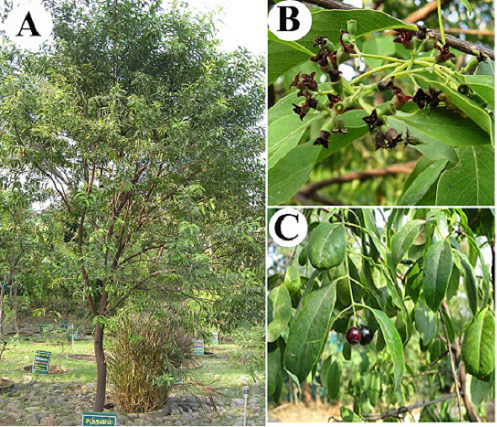 Conclusion: The finding of the present study is believed to be helpful in identifying the correct botanical source of the plant in crude form and also standardization of herbal formulation containing sandalwood as ingredient. Sundharamoorthy S, Govindarajan N, Chinnapillai A, Raju I. Macro-Microscopic Atlas on Heartwood of Santalum album L. (Sandalwood). Pharmacognosy Journal. 2018;10(4):730-733.